Striker Sam Vokes signed a new contract last month - and was followed by boss Sean Dyche last week. Vokes added to from the likes of Scott Arfield, Tom Heaton and David Jones, who extended their stay at Turf Moor in the summer, while Dean Marney's new two-year deal was announced in September. And the Wales striker feels that spate of signings shows everyone is in it together at the club, all buying into the manager's vision: “We’ve had that for a while. The gaffer’s created his own ethos here and that can only bode well for the future with him, signing a new deal. “It’s great to see they’ve done that and it’s a club that’s obviously wanting to be up there. “That’s another reason that the squad is so strong at the minute because they’ve got the backing from the club and the club are showing that intention. “We’ve obviously built a tight-knit squad that’s going to go somewhere." And on the manager's news, he added: “It’s massive. “It shows his intentions and I mentioned it when I signed it’s a club that’s a definitely on the move. You see the gaffer’s signed a new deal, we’re flying at the top end of the table and a new training ground being built shows the intentions of the club at the minute and where they want to be." The quintet were all part of the promotion-winning side two years ago under Dyche, and Vokes sees no reason why Burnley can't match that achievement this season. 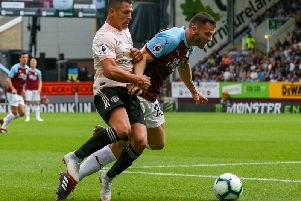 Then, Burnley were surprise contenders, while this time round, after a season in the Premier League, the expectation level is far higher, but Vokes admitted: “I think the gaffer’s made a point of it this year that there’s a different expectation level on ourselves. “We know that going into games, we know that people will be looking at us from the outside as probably favourites, whereas the last time we got promoted we were favourites to go down. “It’s a different point of view but we can take that as a different challenge. "It holds us in good stead because the lads have got some valuable experience from that and the new lads who have come in have embraced that as well I think. It shows how strong the squad is with the results we’ve been picking up lately." Can Burnley go one better this time around and win the title? “I’m not going to look that far ahead. The gaffer’s always said one game at a time. “Obviously we’d like to be up there and around it and challenging for that. “That’s the end goal, to get promoted, but there are a lot of things in between that that happen and the pressure is on us, but I feel we’re strong enough to deal with that." Burnley and Vokes go to Reading tomorrow in good form, but the former Wolves man is wary of the Royals, who won 2-1 at Turf Moor in September: “We’ve seen what they’re about. They’ve lost a couple of players since we played them earlier in the season but they’re still a strong unit. “It’s always a tough place to go but we’ll go there full of confidence and only thinking what we’re about and hopefully pick up the three points. “They’ve got some players who have got promoted with them in the past so they know what it’s all about with that challenge. “We don’t need to worry about them too much, we’re going there full of confidence in ourselves." Vokes is well aware of Hal Robson-Kanu, who could vie with him for a striking berth for Wales in France in the summer at Euro 2016, as well as right back Chris Gunter, who is also a member of Chris Coleman's squad: “I know Hal and Chris Gunter as well from Wales. “There are a couple of players down there from the Wales set up. “I know they’ve got a strong squad all over so it will be a good game." Having returned to the Wales squad over the second half of their successful qualifying campaign, Vokes is determined to nail down a place on the plane: “Especially going into March as there are a couple of friendlies then that I’ll look to be involved in hopefully. “It’s something that’s always there, looking forward, and hopefully breaking into that squad."